There is no finite amount of pretty dresses a women should have. NONE! She should have plenty. Tons. Many. I have mentioned before that orange is my color. I haven't yet determined what draws me to it, or really how great it works on me. 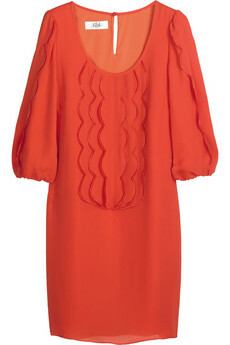 But when I saw this dress I died and went to my pretty orange heaven! I am in love. I know the perfect shoes. Clutch. Do you have a wedding to go to this summer? Bridal shower? Rehearsal Dinner? Girls night out? Oh wait I do!